Using ActiveCampaign? Using it to its full potential? You are probably not. Then read on. We are a group of ActiveCampaign Certified Consultants dedicated to work on this platform day in and day out and we help users get the most out of it. Period. If you are not using the system its full potential you have a Rolls Royce but don’t have the keys and probably neither the time to take it where it can go. I can tell you that, you are under-utilising the tool and it all comes down to the applying the right strategy, tactics and processes to get the most out of it. So, here’s where we can help. I’d love to take you in a journey to show you step by step what you are missing in the platform and the processes you need to put in place to make it work for you. I want to have a personal chat with you to show you step by step what you are missing in the platform and how it can be setup to make the most out of it. – Take you step by step into creating the right strategy for your platform. – And a roadmap to get things done! – PLUS how to get all the tech support, documentation and training needed. Get over your excuses we make the whole process easy, get in touch. We are experts in combining the right strategy with the power of technology to free up huge chunks of time that can be focused back on the business. When we automate processes we increase customer engagement while building efficiency, consistency and rigour into your sales operations. We invest heavily on staying current on lateston staying current on the latest technology and trends to implement best technology available for you. Founded in 2014 by Jorge Gasca, Three Steps Business was a product of his obsession for creating better and more efficient processes with a clear objective to Increase Performance, Process Efficiency, Leads Flow Consistency and Profitability to your business through Marketing & Sales Automation. We can get you started on the right path, you can leverage tricks we’ve learnt since 2013 working with Marketing automation. We have worked with a variety of businesses and have seen pretty much every setup that you can imagine within the platform. ActiveCampaign is a tool that used effectively will save you precious time. You don't need to figure it all out alone. We are here to share what we already know! We will not only help you when required, but we will help you to understand and learn the system overall. We give you a shortcut. We’ve got formulas and worksheets you can use to get started fast! You can count on us being experts at what we do because ActiveCampaign is our sole focus and we don't get distracted with shiny objects or trying to learn other platforms. "We now have automated processes which allows our client to follow the system which is the solution. This saves everyone hassle and time because it's a uniformed process." 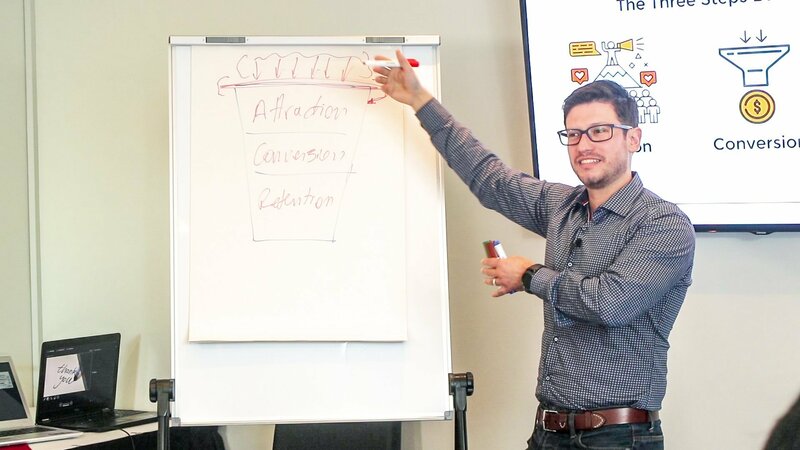 "Jorge and the team at TSB not only have a handle on the mechanics of ActiveCampaign and automation - but understand that what it's really about it is selling and a better user experience. I thoroughly enjoyed collaborating with him." "Jorge and his team created systems to automate areas of my business so I can now focus on lead generation and consultation with serious clients. Jorge has a wealth of technical knowledge that has kept me up to speed with apps and widgets to integrate. He has also helped me dial in my products and pricing. Jorge has kept me on track and I am grateful for his devotion, positive attitude, expertise and skill!" "Three Steps Business have boosted our profits by helping us greatly improve our ability to manage the sales pipeline. I would recommend Three Steps Business to any ambitious business seeking to expand their marketing capacity and streamline operations." " Jorge and his team did a great job setting up the automation for my business. At one stage I was dragging my feet with some info he needed so he came to my office, sat with me, and we got it done." We help you achieve sales and marketing consistency, improve customer engagement by planning and implementing the processes you need to achieve your goals.